“A strong carrier with vertical steel bars can carry even a guitar plus a banjo plus a backpack (or similar otherwise ‘impossible’ loads. As in the previous video ‘ Cheapest strongest bicycle trailer ‘ this vid enables you to survive very well without a car. Ask a friend or any local mechanic to weld a flat bar that extends the carrier to the seat post, and some struts that prevent the carrier wobbling side to side. (Scrounge around or go to a scrap metal place to provide the metal at no/low cost. Basket can be from an old fridge, garage sale, hardware megastore or a shop-outfitting equipment specialist. For the vertical bars, scrounge a lawnmower push handle or similar. They’re pipe, but strong and lightweight. To bind it all together, tie with bicycle tubes cut with scissors end-to-end. Also note the bike stand – two legs, so the bike can stand up by itself, very handy when loading. Available sometimes at garage sales, or new from shop in NZ about $40. CAUTION: As with any car loading, be sure to tie your loads very securely with rubber straps. Risks: Heavy load wobbling in traffic, dangling straps can get into the back hub or derailleur, suddently crippling the bike in traffic. Tie tight, with some EXTRA straps in case one fails. Then face that deadly traffic confident your load is really secure. At the time of writing my left leg is still aching from the steel pin the surgeon had to put in my tibia bone – at an intersection, the violent snout of a green-light too-eager car broke both bones in my left leg. A boxbike (bakfiets) is a kind of cargo bike popularized in the Netherlands. They can be a really useful way to get around — and to move your stuff around – but they are also very expensive to buy (prices are in the thousands). That video was for me a little like visiting Mars. This next video highlights what Copenhagen did to get to a state where so many people are transporting their stuff and themselves on bikes. “Anyone (in 10 mins) can create their own $30 very strong bicycle trailer out of an ordinary hand truck as a bike trailer. Bruce Thomson in New Zealand explains in a slide show demo of many he’s made & used in the past decade. Also gives some ‘surprise tips’ on safety attaching and carrying loads. These trailers take almost no space to store. Nick Johnson in Princeton, New Jersey details his build of a boxbike cargo bike. These go for thousands of dollars, so building one himself would have saved a lot of money. He was looking for a bike that would allow him to transport groceries as well as let him get around. He writes, “Sure, I could simply buy a trailer, but I don’t really like trailers. 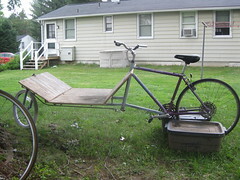 I had built a trailer back in my Virginia days, but I didn’t like how it affected the feel of the ride. The joint between the frame and the weight added an unsettling resonance to the ride, especially around corners. I wanted a design that offeres a more rigid ride. For materials for his boxbike Nick used steel piping he bought at Lowes, a scavenged child’s Huffy bike and scrap plywood he found in a dumpster. Check out what Nick did here. Tony Hoar, who builds and sells various bike trailers, in British Columbia, Canada shows us how to make a DIY bike trailer from an old shopping cart. Here’s a work in progress design from armouredcockroach for a shopping cart bike trailer with an inset wheel. Here Wettke in Europe has made a similar conversion with a shopping cart, but in this case instead of creating a bike trailer he’s put the cart in front and built a trike (warning: spooky organ music). New York bike mechanic, Susan Lindell shows us how to do a basic bike tune-up. Tune Up Your Bicycle For Spring from Etsy on Vimeo. Alan Languirand who lives in Detroit, demonstrates his $30 bike trailer. He made it with steel electrical conduit, hose couplers and bicycle wheels. This is a big achievement because commercial bike trailers similar to this one can cost upwards of $100 in a store. Where I live, the starting price is around $200. Bicycle Trailer from Alan Languirand on Vimeo.